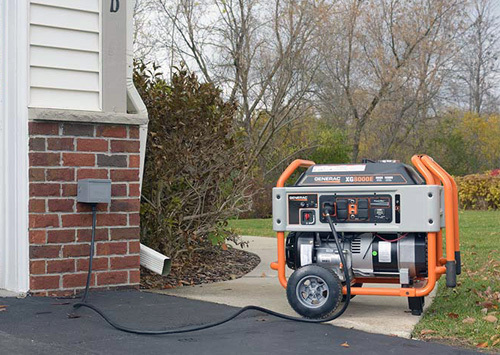 In an emergency, portable generators can provide critical backup power in times of need. Generac portable generators make sure the most important items such as your lights, refrigerators and freezers, sump pumps, even space heaters and window air conditioners—are up and running, minimizing any disruption to your lifestyle. We are an authorized reseller and installer of all Generac products and we can help you choose whether you need a full scale Generac generator or a portable Generac generator. > Download Generac's brochure to view their FULL product line. What is an Interlock Installation? Interlock Installations allow a portable generator to be safely and conveniently connected to a home's electrical panel. This acts as a manual transfer switch so that both the utility breaker and the generator breaker cannot be turned on at the same time which isolates the two systems. Overall safety is incredibly improved because with an interlock installation there is no need to run extension cords into the home which eliminates associated fire and tripping hazards. Your panel board is a distribution and protection system for electricity in your home. Power is fed through the utility into the panel. From here it is run across the different circuit breakers and out into the rest of your home. Our interlock installation process safely disconnects your panel from the utility feed and switches it over to the generator which is being fed through a new generator breaker. With this one connection you can now use anything in your home because all the circuits in your home can be activated through the breakers in your panel. When you hire AJP Electric, you will receive quality electrical service from a locally owned and family operated business with over 15 years of experience in on-site electrical troubleshooting and maintenance. Trying to find a licensed electrician that will fit into your budget is not a simple task. Many don't provide you with a free quote for you to determine if you can even afford them, which often leads to surprise costs that you may not be able to afford. AJP Electric will review your needs carefully and provide you with a free quote. © 2001 – 2018 AJP Electric, LLC. All rights reserved.